Hershel Don Floyd, born November 23, 1931 - died January 28, 2017 was 85 years old. He was born in McHue, Arkansas the son of James Hershel and Lola Gertrude Floyd. He served in the army in Korea. He worked for General Motors Corporation for 43 years as a tool-maker. 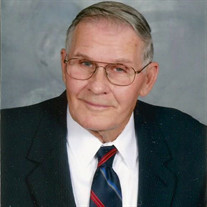 He was a member of First Baptist Church of Arnold, MO. He is survived by his wife Winifred G. Floyd and three sons, Harold D. Floyd of Arnold, MO, James E. and wife Patricia Floyd and Steven W. and wife Carolyn Floyd of St. Charles, MO, five grandchildren, Vivian J Eberhardt, Edward H Floyd, Christina M Floyd, Steven M Floyd, and Amanda N Travis, four great-grandchildren, niece Diane Holloway, nephew Byron Kever. He was preceded in death by his parents, sister Alice Marie Kever and nephew Warren Kever. Visitation will be Monday, January 30, 2017 from 5-7 PM and the funeral service will be Tuesday, January 31, 2017 at 10 AM both at the Willis Funeral Service Chapel.